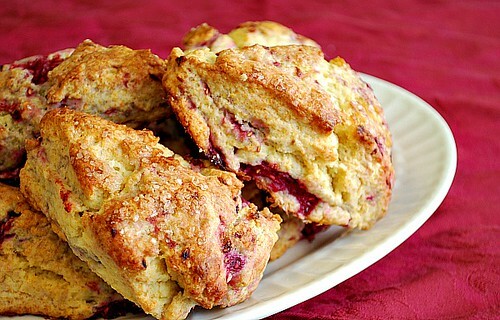 This is my go-to scone recipe of choice and can easily be substituted with any fresh fruit. It works particularly well with fresh berries. These scones bake up moist and requires no additional butter or jam to enjoy. Everything's baked right in! The hardest part is allowing these scones to rest for 10 minutes to cool and helps to set up keep it's shape. If you eat them too soon, they'll just crumble... so patience is definitely needed! Adjust an oven rack to the middle position and heat the oven to 425 degrees. Place the flour, baking powder, sugar, and salt in a large bowl or the work bowl of a food processor fitted with the metal blade. Whisk together t process with six 1-second pulses. If making by hand, use two knives, a pastry blender, or your fingertips and quickly cut in the butter until the mixture resembles coarse meal with a few slightly larger butter lumps. If using a food processor, remove the cover and distribute the butter evenly over the dry ingredients. Cover and process with twelve 1-second pulses. (Add the zest (& cranberries) and quickly mix in or pulse one more time.) Transfer the dough to a large bowl. Stir in the heavy cream (& blueberries if using) with a rubber spatula or fork until the dough begins to form, about 30 seconds. Transfer the dough and all dry flour bits to a countertop and knead dough by hand just until it comes together unto a rough, slightly sticky ball, 5 to 10 seconds. Press the dough into an 8 inch cake pan, then turn the dough out onto a lightly floured work surface. With a sharp knife, cut the dough into 8 wedges. Place the wedges on an ungreased baking sheet. Brush the tops of the scones with 1 tablespoon heavy cream and then sprinkle them with 1 tablespoon sugar just before baking. Bake until the scone tops are light brown, 12 to 15 minutes. Cool on a wire rack for at least 10 minutes. Serve warm or at room temperature. Raspberries are on sale here, too. And these look soooo worthy, YUM! Ohhhh yum! These sound so delicious! 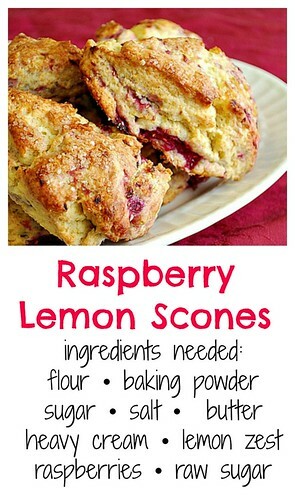 I lovvvvve scones and these look really really good. I only wish I had more room in my freezer for berries! These look delicious! I think I'll try these out this week since I just got a bunch of fresh radpberries. These look delicious. The berries make them much richer. I can imagine how good they taste.